Check AP Inter 1st Year Results 2019 : AP Intermediate 1st year results 2019 has been announced by the Board tentatively on 12th April 2019. Candidates who had appeared for AP Inter 1st year examinations will be able to check their result on Board’s official website. AP Intermediate 1st year results 2019 can be fetched by using hall ticket number. 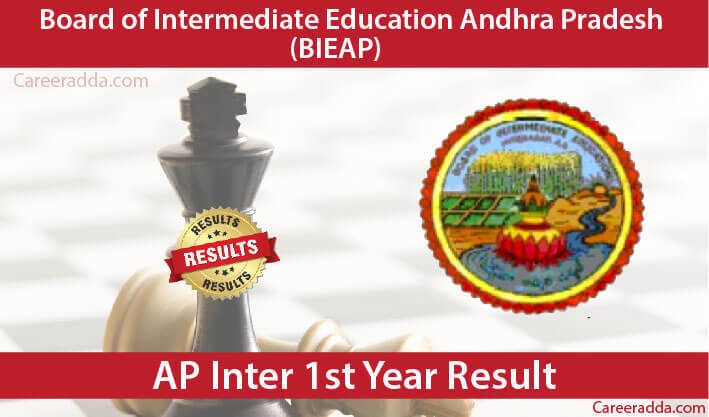 AP Board Inter 1st year results 2019 has been announced by the Andhra Pradesh Board of Intermediate Education on 12th April 2019. Like always, this year as well Board has released Intermediate 1st year’s results as per the academic schedule. Intermediate 1st year’s examinees are excited about their results. To push up their excitement on 12th April 2019, the Board has released Intermediate 1st year’s results. AP Board’s Intermediate 1st year’s examinees can check their results by visiting official website AP results @ https://results.apcfss.in/ or Jnanabhumi website or via SMS. We know that you guys out there will be not aware of procedure to check AP Board intermediate results 2019. Therefore, we have decided to explain and write here each way of checking Intermediate 1st year’s results in the 2019. Checking Intermediate 1st year’s results in 2019 through Board’s official website will be the easiest way for examinees as for this they don’t need to go anywhere. With just a Smartphone or laptop, examinees can check their results. However, internet is must to check results via Board’s website. Complete procedure in simple steps is given below. Intermediate 1st year’s examinees need to follow a below-given process to check their results. Along with above mentioned ways of checking AP Board 11th results 2019, examinees can also check their result from our web portal because once results are announced here we will update a direct link for them so that they can easily check their AP Inter 1st Year’s results without wasting even a second. In addition to above mentioned ways, AP Board 1st year’s examinees can also get their results through other modes like RTGS portal, ‘Kaizala’ & ‘People First’ mobile application. Not only this, a user having AP Fiber – TV can also gets AP Board 1st year result on his/her TV screen. After official result announcement, a notification will be pop up on AP Fiber – TV to notify users. A user will need to select the index and type the hall ticket no. to get his/her result on AP-Fiber TV screen. Most of the examinees out there will not know that what to do after checking AP Board 1styear results 2019 because this is their first time when they will check their results through Board’s official website. If it is so then don’t worry as here we are available to help such guys. After checking AP Board inter 1st year results 2019 the first thing you will need to do is to verify your information printed on your result. You are required to verify the following details: your name, roll/hall ticket number, subjects name etc. After verifying all the details, now you need to print your result on A4 size paper. Keep print copy of your result safe until you will get original result/mark sheet from Board. Generally, Board issues original mark sheets and results after a month from the date of result declaration. After announcing results successfully, the board will issue result documents to each registered candidate. Generally, Board issues original result documents i.e. mark sheet or certificate after a month from the date of 2nd year result announcement. and there won’t be any mark sheet for 1st year alone . As per the official news AP Inter 1st year results has been released on 12th April 2019. Like previous year, this year too, AP state Inter board officials released AP 1st year results 2019. Instructions for checking AP Intermediate 1st year results 2019 are given above. Andhra Pradesh Board’s 1st year is a one year’s course to be pursued after clearing 10thexaminations. AP Board’s Inter course is entirely managed by the Board of Intermediate Education, Andhra Pradesh (BIEAP). This year’s AP Board inter examinations were held from 27 Feb to March 16, 2019. The examination timing was from 9:00 A.M. to 12:00 Noon. Practical examinations were conducted in between Feb 01 to 20, 2019. This year’s results stats will be available after result announcement. However, we have last year’s Inter 1st year results statistics. Looking at the last year’s result statistics just before the announcement of AP Inter 1st yr. result will be a good method for this year’s examinees to predict the results. Before checking your AP Inter 1st year results, you should have to know about Board’s grading system. It will help you in understanding your result. Andhra Pradesh Board or Board of Intermediate Education, Andhra Pradesh (BIEAP) was established in the year 1971 with an aim to provide quality education at 11th & 12th level to the students of Andhra Pradesh. Since its establishment, the Board is administered by the Government of Andhra Pradesh. Presently, Board has its own office in Vijayawada. Once and for all, we at Career Adda just want to say that if you still have any query or feedback then feel free to contact us. We are available round the clock for your guys. Moreover, if you liked our work then don’t forget to share it with others. We wish you Best of Luck for your Andhra Pradesh Board inter 1st year results 2019.